Shredded brussels sprouts are faster and more reliable than roasted, and they come together with sweet potatoes and, in a surprise twist, deli smoked turkey. I prepared this as a side to boxed mac’n’cheese while running in an out of the kitchen to console two crying babies. I thought I had a nice window of time to make myself dinner after one was done eating, but ten minutes in he decided he hadn’t eaten enough and his brother woke up too. If nothing else, that should prove that this is a pretty easy recipe. I use deli smoked turkey here for two reasons. The first is that I had it in my fridge, and they key to cooking interesting food that you like is using ingredients you already have on hand. The second is that it works like bacon in this recipe – smoky, salty, and crispy – but out of habit I don’t cook or eat bacon at home. 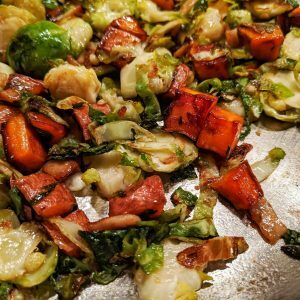 I don’t use a ton – just enough to break up the texture once in a while, since I still want the dominant ingredient to be the brussels sprouts. The maple syrup makes a nice sweet contrast to the saltiness of the meat, and the sweeet potato compliments that and adds a little substance. This is a nice side dish, but increase the sweet potatoes and add some eggs and this would be a great hash on its own. Slice 1 lb brussels sprouts in 1/8″ thick rounds and set aside. Dice a small sweet potato (no more than 2-3 inches around) with the skin on – around 3/4 cup – and place in a skillet with enough oil to coat over medium heat. Meanwhile, slice two pieces of deli smoked turkey into small strips – 1″ x 1/2″ or so. Cook the potatoes 5-10 minutes or until they are cooked through and slightly browned. Add the turkey and cook until it begins to crisp. Finally, add the brussels sprouts with salt and pepper. Move everything around the pan enough to begin to heat all the brussels sprouts evenly, then spread into an even layer and allow to cook 2 minutes or so at a time to begin to brown the greens. Once the brussels sprouts are soft and browned on the edges, stir in 1 tsp maple syrup and turn off the heat. Let the syrup caramelize before removing everything from the pan.